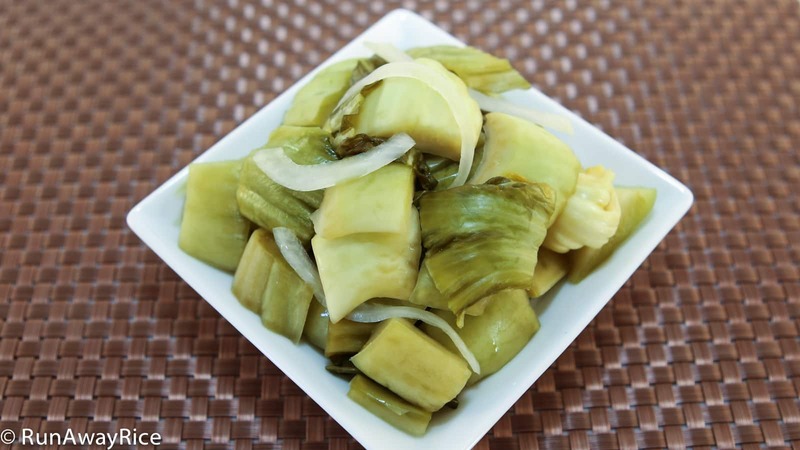 Pickled Mustard Greens (Dua Cai Chua)Pickled Mustard Greens (Dua Cai Chua) are wonderful condiments and this easy recipe shares how to make these delicious homemade pickles. Mustard greens are sturdy vegetables and so are really great for pickling. When pickled just right they are crispy and satisfyingly tart. My Mom use to make jars and jars of these delicious mustard greens around Vietnamese New Year/Tet for our family. It wasn’t until I tried making them for myself that I quickly learned there is an art to pickling perfection. If not properly prepared, the mustard greens become soggy or never pickle. The goal is to have the mustard greens turn a light yellow indicating the fermentation process is successful. Below is my family recipe and the “secrets” for making the perfect pickled mustard greens. Avoid any type of contamination. Make sure utensils and pots are clean including the pickling jar. Any unwanted oil or grease will cause the greens to not pickle properly. I use plastic spoons instead of wooden or bamboo utensils during the preparation process. Wooden and bamboo utensils have a tendency to absorb oil and other foods from prior cooking. Nothing is worse than trying your pickles for the first time after waiting for 5 days and finding out they are soggy and wilted. If your jar has a metal lid, cover the jar first with plastic wrap before using the lid to seal. On Day 3 you can eat the mustard greens. They will be crispy, slightly tart and spicy. The longer the greens pickle the more sour the taste. I like to pickle my greens for 5 days. 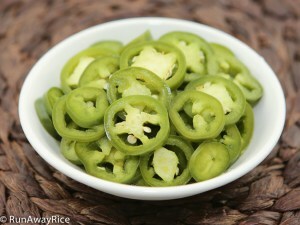 After 5 days, the greens are deliciously crunchy, tart and not too spicy. 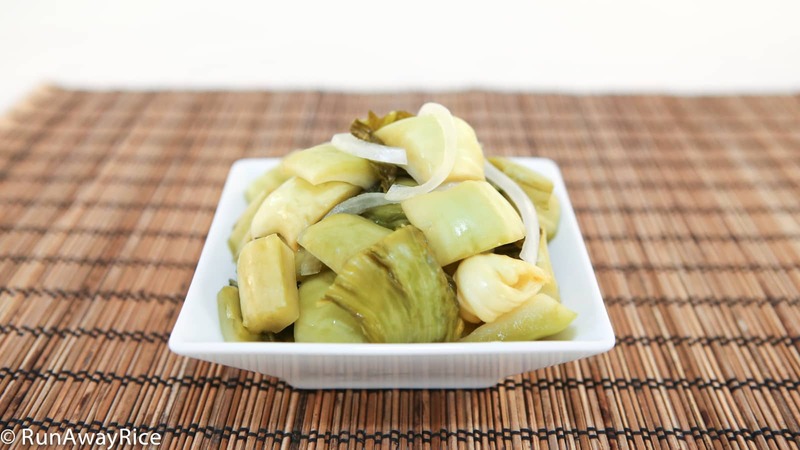 To stop the pickling process, drain the liquid and refrigerate the mustard greens. Once refrigerated, enjoy the greens within the month. Cut off ends of the mustard greens and discard. Trim the greens of areas that are broken, bruised, yellow or eaten by bugs. Wash the mustard greens thoroughly with cold water and then shake off the excess water. Place greens in several large colanders or spread on large kitchen towels and allow to air dry overnight. Bring the water to a gentle boil in a medium saucepan. Allow to cool for approximately 45 minutes. The water should be warm for the step below. Wash the jar thoroughly with soap and water. Shake off excess water. Microwave jar (without lid) on High for 1-2 minutes to sanitize and dry completely. Separate leaves from the stems. Cut leaves into sections approximately 2-3 inches wide and 1- 1 1/2 inches long. Place cut leaves in a separate bowl. Cut stems into small pieces, approximately 1-inch sections. Place cut stems in another bowl. Thinly slice the onion and add to the bowl with the stems. Pour the warm water into a large measuring cup or bowl. Add the sugar and salt. Stir to dissolve. Put a handful of the mustard green leaves in the jar lining the bottom. Add a thin layer of sliced onions next. 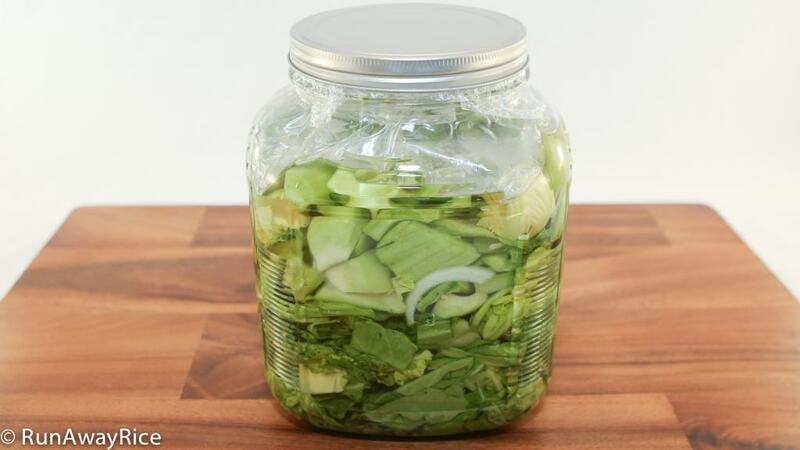 Continue alternating a layer of leaves with a thin layer of the sliced onions until all leaves are in the jar. Next, add the stems to the jar. Fill the smaller re-sealable bag with 1 cup water. Remove the air from the bag and seal it completely. Place the water bag inside the larger bag and seal the larger bag securely. Place the water bag inside the jar on top of the mustard greens. Make sure the bag covers the greens and keeps them submerged in the liquid. Cover the mouth of jar with plastic wrap and secure with a lid. Place the jar in a sunny location and allow to pickle for 3-6 days or until the mustard greens wilt and turn pale yellow. 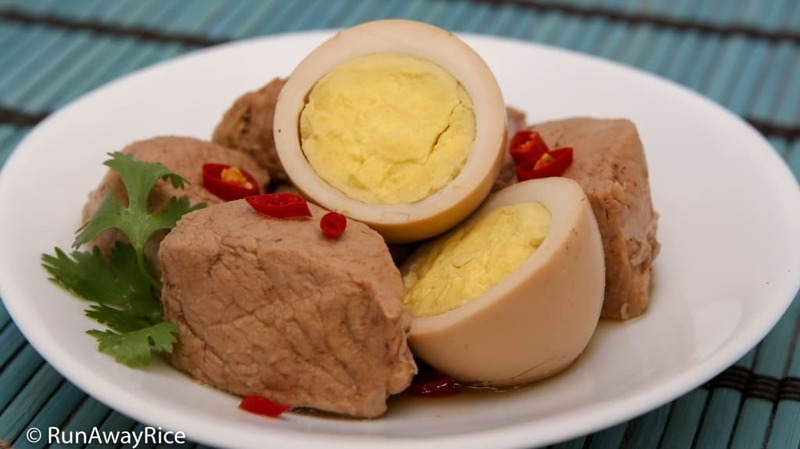 Enjoy the Pickled Mustard Greens with your favorite savory dishes like Braised Pork and Eggs (Thit Kho Trung). Store in the refrigerator and enjoy within the month. Thank you Trang for your amazing blog and videos. 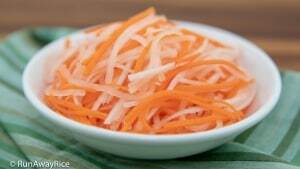 It’s a great resource for Vietnamese recipes. Your blog saves me from calling my mom five times a day! Hi Trang. The pickle water turned cloudy on the 2nd day- is that normal? If it’s about to turn rotten, how can I save it? A little bit of clouding is normal on day 2. If the brine turns dark or you see mold on the mustard greens, it’s contaminated. The best way to tell is to smell it. It will smell really bad if it’s contaminated in which case, you need to throw it out. Good Luck and let me know how it turns out for you. Trang, where we leave it’s winter and we get little sunlight. 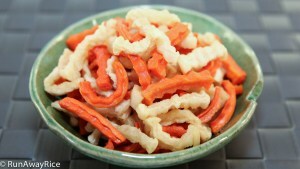 What suggestions can you give to help with the pickling process? I’m current placing the jars under the light on my stove top. Will this work? Is the pickling process required sunlight or more of a warm locations? Hi, a little bit of light and warmth is all that is needed and near your stove top is just fine. Don’t let the jar get hot though. Enjoy the recipe! How long are the pickled greens good for? Also can I use regular mustard greens or does it have to be Asian mustard greens? The pickled greens are good for up to a month in the refrigerator. You can use any type of mustard green or vegetable with this recipe including cucumbers, carrots, etc. Hope that helps. Chi Trang ok, what type of salt can we use for this pickle? Thank you! No special salt is required. I just use table salt. Good luck with the recipe.